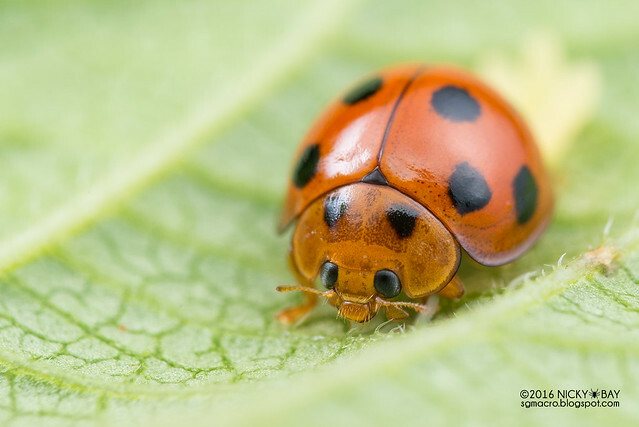 Ladybird beetles are frequently portrayed in childrens' books and nursery rhymes, but few know that they possess noxious chemicals which wreck havoc on taste buds when consumed. In fact, they are known to emit a lingering odour when disturbed or smashed, and can ruin the taste of wine produced from the vineyards. 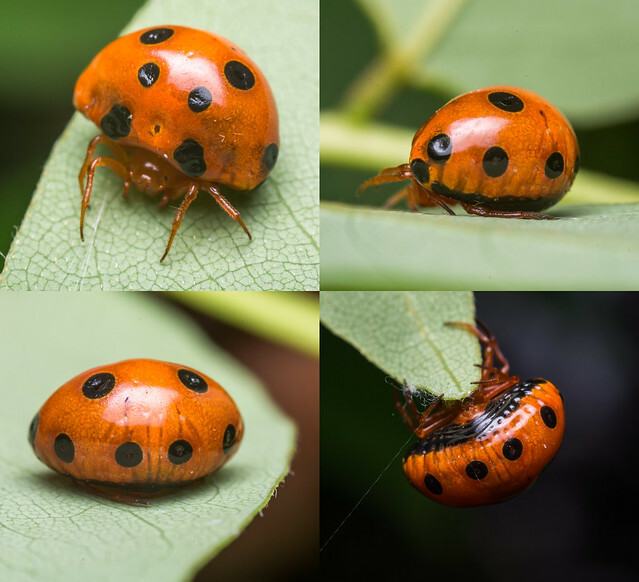 Brighter ladybirds with distinct spots appear to taste the most rancid, leading birds to recognize these unsavory lunch targets from afar after an initial bad experience. 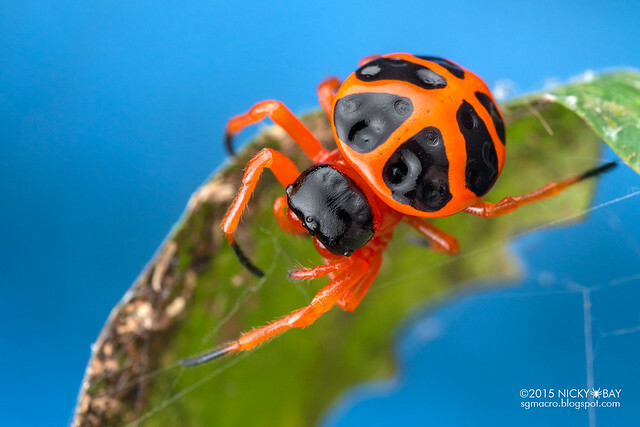 This photo series focuses on a rare genus of spiders (Paraplectana) together with some other arthropods that may have discovered the birds' natural avoidance of these little beetles, and have evolved to mimic ladybird beetles to achieve the same effect. The mimicry is amazingly good and had quite a lot of people fooled! All photos in this series were shot with my Nikon D800, Tamron 90mm and Raynox DCR-250. 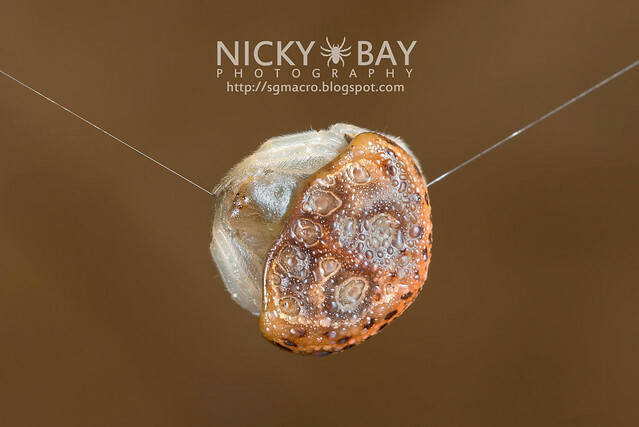 Check out my Macro Equipment page for more details on my setup. 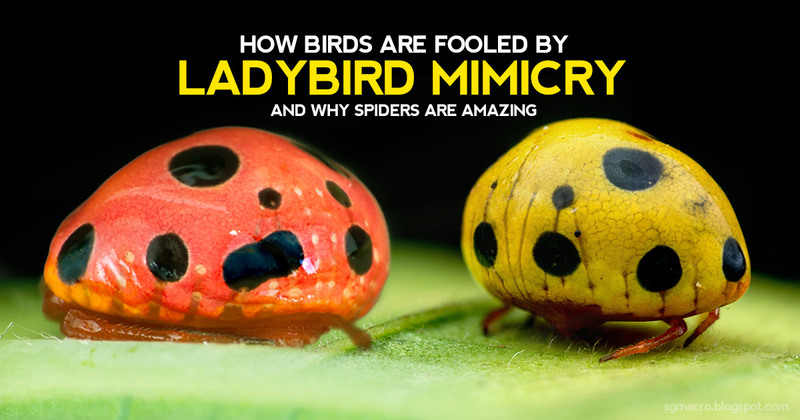 Here's a short video showcasing the ladybird mimicry, available in 4K! 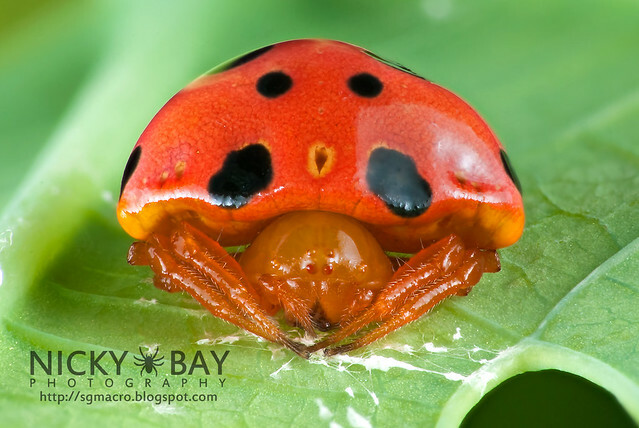 One of the classic ladybird beetles found in Singapore bearing the distinct red colour and black spots. 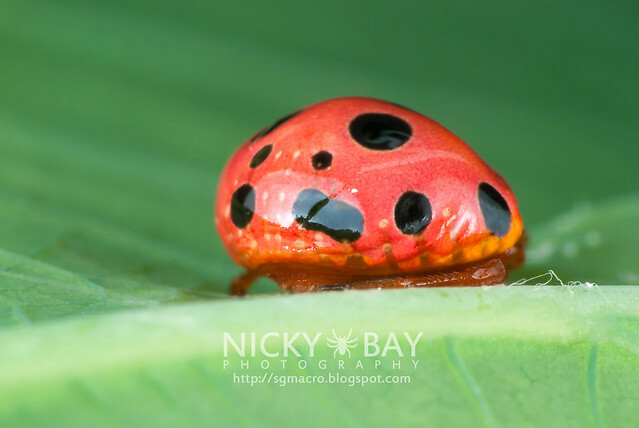 For more photos of ladybirds, check out my ladybird beetle checklist. Those with an untrained eye wouldn't think too much when they see this "ladybird beetle". 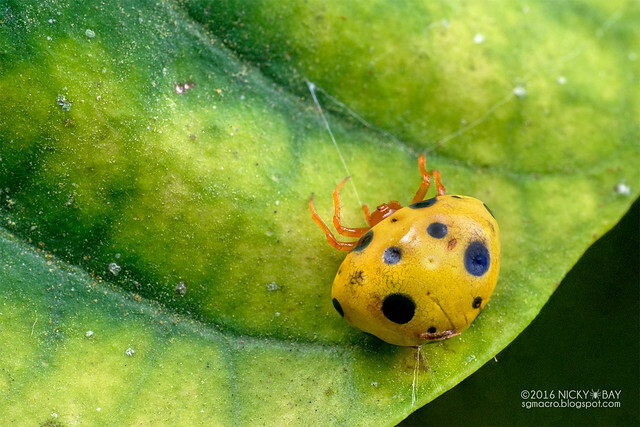 This bright-bodied, spotted creature turned out to be a beautiful spider! This is a perfect example of Batesian mimicry where a species imitates the warning signals to get the protection with its perceived foul taste. Another possible reason for the bright markings, is that it has an instant correlation with danger, and other animals would instinctively steer clear of it. Possibly the same reason why stop, warning or danger signs are almost always in red or yellow. This spider is incredibly rare, with my next sighting only possible with some tip-offs after over 150 field trips 3 years later. As usual, when disturbed, it turned around to try to scare me. BOO! 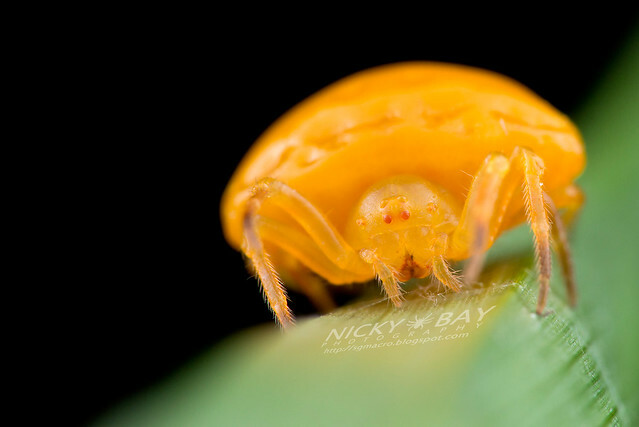 This adorable yellow version of the ladybird-mimic was first spotted (no pun intended) by another group of macro photographers from Singapore in 2015. It took me over a year, but I finally found an extremely gravid specimen on the last day of 2016! Dorsal view. If not for the legs, most others would have thought of ladybird rather than spider! Again, she turned around in an attempt to scare me. 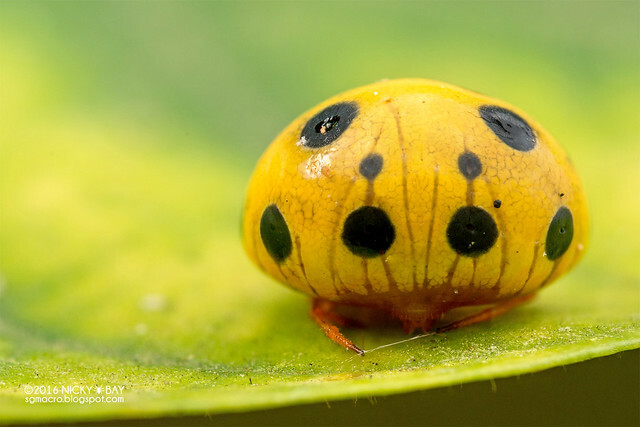 Not all species in Paraplectana have black spots like the ones above. 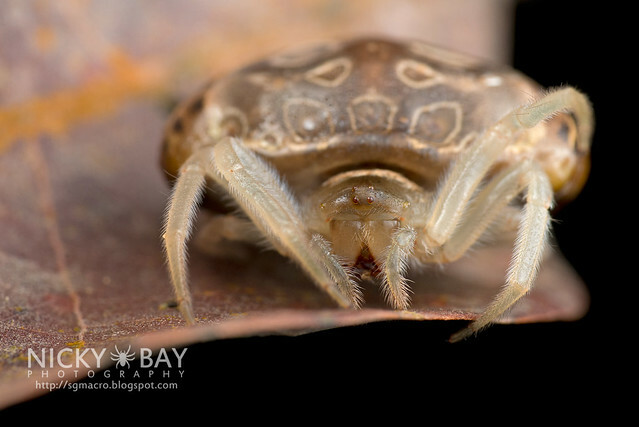 They are recognized by the semi-circular abdomen, and sometimes confused with Cyrtarachne. These Paraplectana are surprisingly tiny. Those featured here were between 5mm to 8mm wide. Despite the lack of spots, the spider above could very well be mimicking this ladybird beetle! 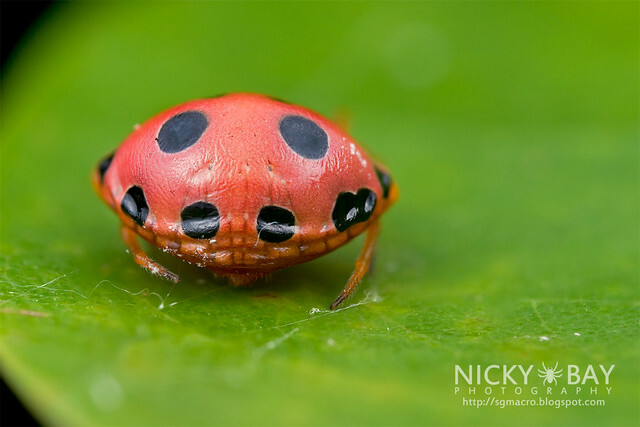 The last Paraplectana in this series doesn't seem to match any of the ladybird beetles that I have shot before. This spider could be new to science and does not have name yet. 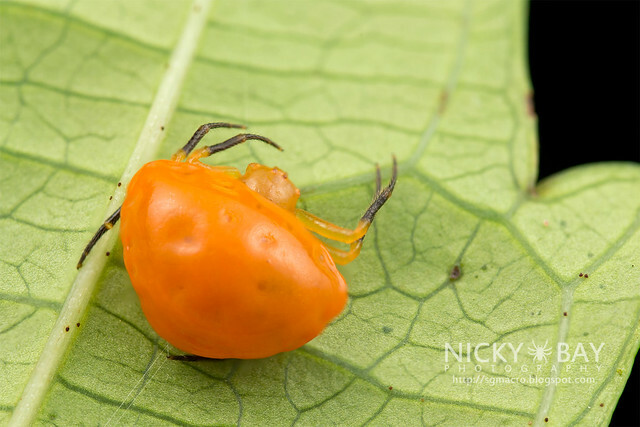 Among my friends, we called this the golden coin spider. I have at least 3 records of this spider but none were mature. This Paraplectana was described in 2015 from India by Javed Ahmed, named after naturalist and birder Rajashree Khalap. Previously, publications on Paraplectana had never documented the internal genitalia and this seems to be the first. It remains to be verified if the ones found in Singapore are the same as this species. 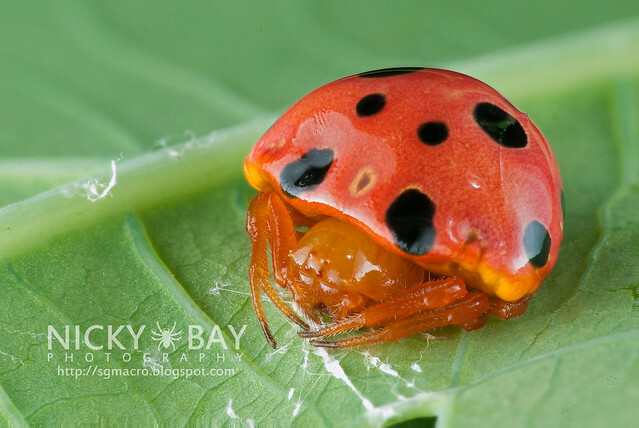 Another brilliantly coloured spider from the same family, Encyosaccus does not have the same abdominal pattern but the same bright colours would lead one to believe that they could be ladybird mimics too. 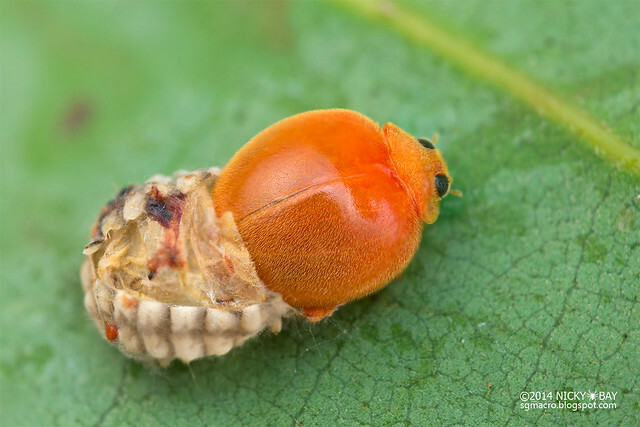 Read my series on the Adorable Tortoise Orb Weavers from the Amazon. Spiders were not the only ones in the mimicry game. This handsome fungus beetle is also commonly mistaken to be a ladybird beetle for its red body and black spots. 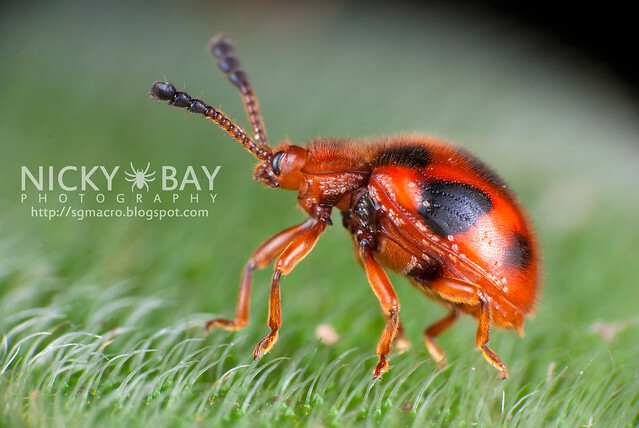 View my Handsome Fungus Beetle Checklist. 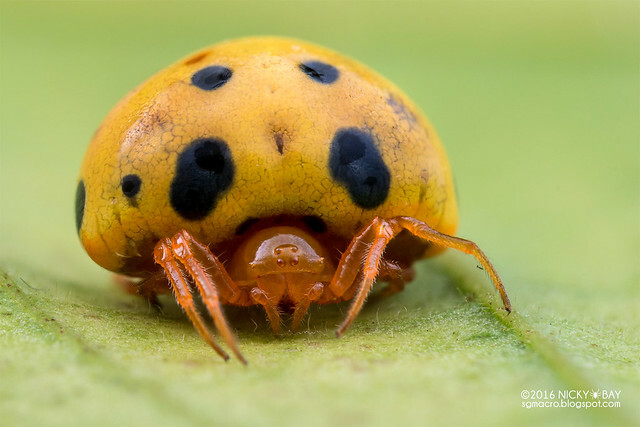 There are other known ladybird mimicking spiders, such as some species of Eresus which could be found in Europe. 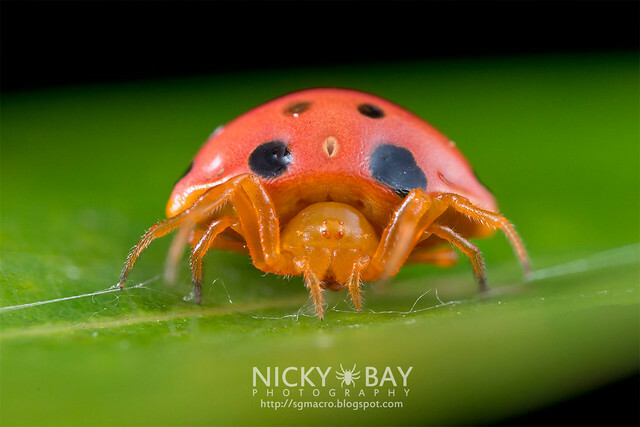 Do you know of other ladybird mimicking creatures? Let me know in the comments below, I would love to hear from you!